Installing kitchen blinds is a great way to improve the appearance of your kitchen. It makes the kitchen look more personal and stylish. The kitchen is a room in a home where the savory cooked meals are being made. It’s a place where families bond together in joy and laughter. But kitchens can also be a place of spills, high temperature and tarnish. There are lots blind types to choose from to use in your kitchens. Some good choices are faux wood blinds because this type does not crack under heat that is usually produced by stoves and ovens. Why are kitchen blinds needed? Window blinds are energy savers and can save you more money by lowering your energy bill. Blinds offer excellent insulation so this enables your kitchen to stay warm in the winter season and cool during the summer months. Kitchens involve the use of heat and water. These blinds are water and humidity resistant so they are low-maintenance. They are also very easy to clean in the event of grease build-up. There are so many types, colors, patterns, and designs of kitchen blinds out there. You can really choose something that will match and complement the existing decor of your home. Whether it be the traditional or contemporary, modern design. And you can base your decision on your budget at hand. 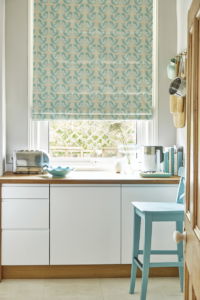 With all the benefits stated above, installing and using kitchen blinds is definitely one of the most cost-efficient and easiest ways to give your kitchen an upgrade. Privacy, control, ease of maintenance, and the sunlight-blocking ability – what more can you want, right?